Imagine you’re mid-ocean and you or your crew get into a life-threatening situation. What do you do? One of the first things to do is activate your EPRIB. EPIRB stands for Emergency Position Indication Radio Beacon. It is used in an emergency to alert the search and rescue services. The small device no bigger than a protein shaker, when activated, transmits a signal via satellite to the nearest rescue services, informing them you require assistance and providing them with your location. Rannoch Adventure recommends and supplies the rescueMe EPIRB1 as it is the world's most compact EPIRB on the market, weighing in at just 422g. It has a built-in GPS which enables the rescue services to accurately locate it within 50 metres. It also has two high brightness flashing LED lights on the top of the unit to maximise visibility. Once activated, it will transmit for up to 48 hours at temperatures down to -20°C. For ocean rowing, we recommend purchasing a manual EPIRB. A manual EPIRB is activated via the method below - HOW TO USE YOUR EPIRB. An automatic EPIRB is activated when immersed in water. This is not ideal for ocean rowing because if a wave comes crashing over the boat, it could activate the emergency unit. Most ocean race rules specify a manual EPIRB, with it being a compulsory piece of kit. Some ocean rowers have used a hydrostatic EPIRB. This sits in a housing and is automatically deployed when submerged in a water depth of 2 - 4 metres. To activate, start by pulling the antenna up. Then pull back the red tab and press button for 1 second. Activating an EPIRB under false circumstances can come with a hefty fine! The figure is unconfirmed but is somewhere in the region of £5,000 or more! We recommend attaching your EPIRB to the bulkhead of the main living quarters of your ocean rowing boat. For example, the stern cabin bulkhead on your R45, R25 or R15 or bow cabin bulkhead of your R20 or R10. We advise it is fitted to the opposite side of the hinges of the cabin hatch. In other words, the same side as the cabin handles. This means it is easily accessible when you are in the cabin. 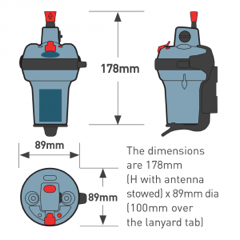 It is attached to the boat with a quick release bracket which comes supplied with the EPIRB. HOW MUCH IS AN EPIRB? At the time of writing this post, the current retail price is £370.80 (prices do vary). There are no subscription or maintenance costs for the unit. WHAT IS REQUIRED AFTER PURCHASE? When you purchase your EPIRB, you will need to register it in your country, providing personal contact details and information about the boat it will be used on. In the UK, this is done via the Maritime and Coastguard Agency. You will also need to write the Call Sign, Vessel and MMSI (Maritime Mobile Service Identity) on your EPIRB unit. There is a sticker for this specific information. 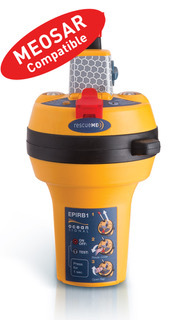 The rescueMe EPIRB1 has 9V lithium battery with a life of 10 years. The unit has an expiry date (the same as the battery life) which should not be exceeded! Your EPIRB is your lifeline when at sea. CAN I BUY A SECOND-HAND UNIT? It is possible to buy a good quality second-hand EPIRB, however, at Rannoch Adventure we advise our customers to buy all safety-related equipment brand new to ensure they are 100% reliable. If you do buy a second-hand EPIRB, there is a different registration process. You will need to contact Ofcom to change the details attached to the unit. YOU SHOULDN’T GO TO SEA WITHOUT ONE! Rannoch Adventure is the market leader in ocean rowing boats. We also provide onshore and offshore training, equipment advice, weather routing, race tactics and boat logistics. If you have any questions about an EPIRB or any other equipment for ocean rowing, please get in touch with us via email on info@rannochadventure.com.